"...Desc: wedding on wedding car. couple name is "Gerald" and "Alicia"
A couple which girl in white grown and man in black texudo suit and white shirt sitting in "pepper white" mini cooper wedding car. I will also forward you our "mini cooper car" in different angel to see which is best match your sight, also our face photos for referrence as well. by the way, we have make up our mind to have Chinese traditional outfit instead of English Tuxedo/Gown. both sits or stand beside the car and please we do not require any head gear. Also include our names Gerald and Alicia and our wedding date is 03 October 2009 - Chinese calendar is August 15." 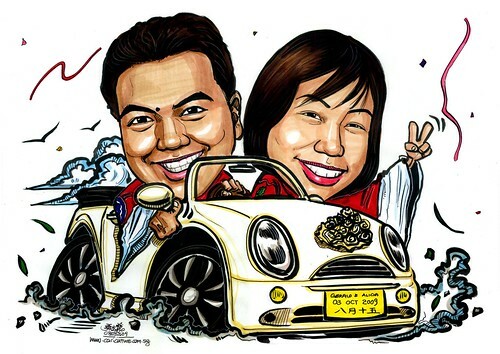 Something different - traditional Chinese wedding couple in a Mini Cooper convertible, instead of 轿子. During a wedding, bridal cars are one of the important things to have. This is one important symbol in a wedding. It comes along with flowers and ribbons to make it look elegant and attractive.